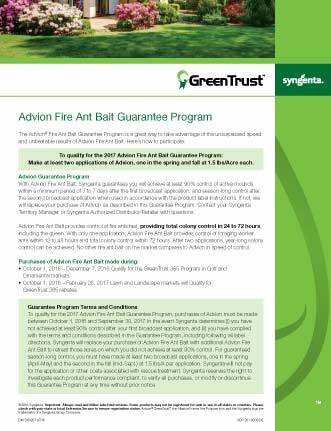 View the Labels/SDS information for Advion Fire Ant Bait Insecticide. Advion® fire ant bait is an effective, fast-acting bait with an alluring formulation. Faster than any other fire ant bait on the market, Advion fire ant bait ensures total colony control within 24-72 hours. It is important to remember that to use Advion Fire Ant Bait for sod farms and pastures grazed by horses and other companion animals, the applicator must have the approved supplemental label with them at the time of application. Performance evaluations are based solely upon interpretation of public information and field observations. 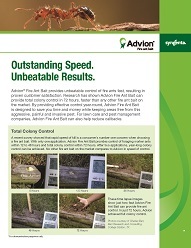 Results can be seen within hours of applying Advion fire ant bait. Since the ants are attracted to the bait, they will actively seek it out and bring it back for the entire colony to eat, including the queen. Pictured [left] Advion application, [right] 1.5 hours later. Pictured [left] 48 hours after application, [right] 72 hours after application. In seven field trials throughout Texas and Florida, Advion achieved 96% control of fire ant mounds, just three days after treatment. In these same seven trials, Talstar® insecticide and Amdro® fire ant bait achieved just 61% and 58% control, respectively. A great way to take advantage of the unsurpassed speed and unbeatable results of Advion Fire Ant Bait. Get unbeatable control of fire ants fast with Advion Fire Ant Bait.